Elgin has an abundance of things to do and see locally. 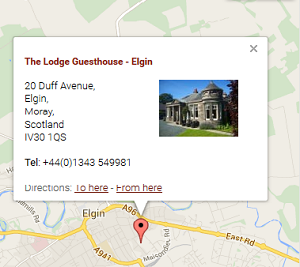 The Lodge is very centrally located and it is a short walk to Elgin's Historic Cathedral, Johnstons Cashmere Centre, Restaurants, the Cinema, pubs and clubs. Elgin is only 6 miles from the beautiful coastal town of Lossiemouth which boasts 2 beautiful beaches, a marina and championship golf course. The latest visitor attraction to open is Covesea Lighthouse - a very prominent landmark from the west beach. If you are relatively fit you can book to visit the lighthouse on a Saturday and enjoy the panoramic views over the Moray Firth, the local RAF base, home of the Typhoons and Lossiemouth and surrounding countryside. There are many walks along Moray's coastline where you can experiences sandy beraches, cliffs and fishing villages. If you head inland you can join The Speyside Way which has an abundance of differnt walks and will climb heather clad hills and walk through spacious glens. Speyside is the home of the Malt Whisky Trail and many of our world famous distilleries have visitor centres and tours which are open to the general public .. and of course where you can enjoy one of the drams. Rich in history Moray boasts a Castle Trail which stretches the length and breadth of the area - enough to keep you busy for a week. Elgin and surrounding area is ideal for cycling too .. whatever the level of skill and experience. Very popular in Moray is golf with a variety of inland and links courses all of which welcome guests. Whatever you like to see or do ... Elgin and Moray has it all.